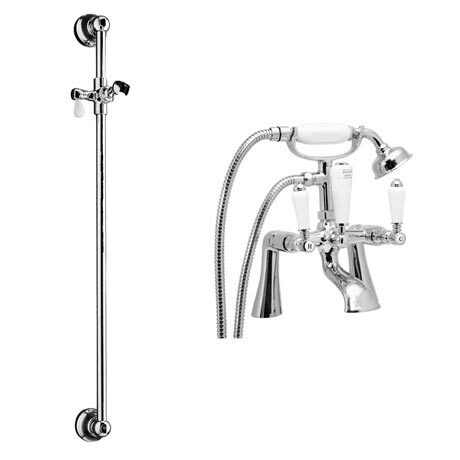 The classic Lancaster traditional bath shower mixer with shower slider rail kit, part of our range of quality chrome plated deck mounted traditional bathroom taps, features a elegant spout design and expertly crafted white ceramic lever handles, its classic design will bring a touch of sophistication to your Bathroom. Manufactured from solid brass with a stunning chrome finish. Includes standard cradle, ceramic diverter, flexible hose, ceramic telephone handset and traditional wall mounted slider.